Chinchilla towels are soft and fluffy, just like their namesake! The Chinchilla Microfiber Buffing Cloths, in two sizes, will be your go-to quick detailing and waterless washing towels. Each thick, plush towel is made of dense 600 g/m² microfiber with a deep pile surrounded with a red cloth border. 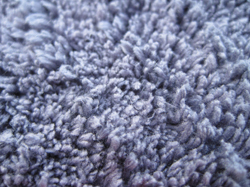 These towels are soft enough to earn the name Chinchilla and durable enough to use for frequent detailing. Save on both towels in the Chinchilla Buffing Cloth Combo. The Chinchilla Microfiber Buffing Cloths are ideal for wiping down your vehicle's paint because the deep pile allows dirt to gather between the long microfiber threads, rather than being rubbed against the paint. Lubrication with a quick detailer or waterless wash enables the Chinchilla Microfiber Buffing Cloth to glide over the paint, grabbing every speck of dust. The long, silky fibers buff away fingerprints and smudges, too. This 16 x 16 inch towel is handy for wiping down the dashboard and instrument panels when used dry. It can also be used for quick detailing of the exterior. Use the Chinchilla Microfiber Buffing Cloths on any type of finish: paint, clear coat, chrome, glass, and plastics. The soft threads will not scratch. When you're done detailing, toss the Chinchilla Microfiber Buffing Cloths into the washing machine with your other microfiber towels and BLACKFIRE Microfiber Cleaner & Restorer. When washing and drying microfiber, always avoid bleach, fabric softener, dryer sheets, and high heat. Tumble dry on low heat or hang to dry. Add the Chinchilla Microfiber Buffing Cloth Combo to your microfiber collection. They are the right blend of softness and durability needed to apply quick detailers, waterless washes, and spray waxes. A total retail value of $15.98. Save $2.99! Chemical Guys EcoSMART Waterless Wash Concentrate 16 oz. Haven't used them yet, but I am very impressed with how soft they are. Can't wait to use them. I hand washed them linted everywhere, machine washed them linted everywhere. Cannot stop linting. Super plush, this is the final towel I use to finish the job. Very soft and plush. Mainly use these for removing wax, sealant and quick detainers.